Elearning! February / March 2015 31 to expose challenges, to not create work- arounds, because work-arounds won't get us to where we need to go as an organization. Tey must help us to see what the challenges are that inhibit them from performing at their maximum." Another key part of this forward-think- ing approach is the active participation of leadership. "Our expectation of our leaders is to work with their staf in a new way," Becerra notes, "involving them in problem-solving, hearing from them, listening and coaching them to identify better ways to work." In the end, it's getting cooperation at every level, Becerra continues: "Our expectations are for staf to engage in higher levels of trust with each other, and to try new ways of doing things. Right now, we have a culture that thinks outside of the box. We have formal learning to help create that culture, classroom settings, workshop settings. We're also taking learning out to staf and management in the units, coaching and helping them understand this lean way of thinking." A SUCCESSFUL PROGRAM Last year, Scripps Health was not only named to Elearning! magazine's "Learning 100" list, it was at the top of the private sector list. One of the programs that helped Scripps attain that lofy position was its new Graduate RN Residency Dedicated Education Unit — a perfect example of how the company treats its valued employees. 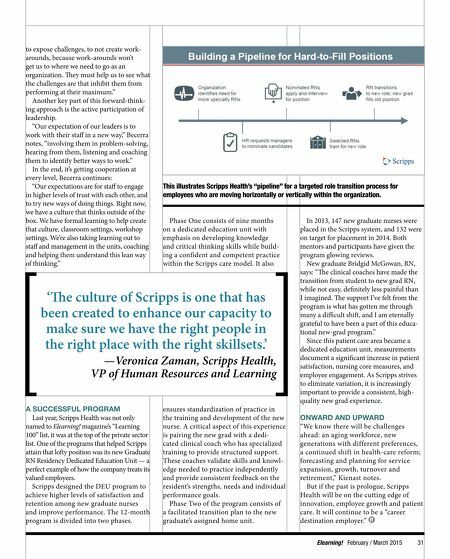 Scripps designed the DEU program to achieve higher levels of satisfaction and retention among new graduate nurses and improve performance. The 12-month program is divided into two phases. Phase One consists of nine months on a dedicated education unit with emphasis on developing knowledge and critical thinking skills while build- ing a confident and competent practice within the Scripps care model. It also ensures standardization of practice in the training and development of the new nurse. A critical aspect of this experience is pairing the new grad with a dedi- cated clinical coach who has specialized training to provide structured support. These coaches validate skills and knowl- edge needed to practice independently and provide consistent feedback on the resident's strengths, needs and individual performance goals. Phase Two of the program consists of a facilitated transition plan to the new graduate's assigned home unit. In 2013, 147 new graduate nurses were placed in the Scripps system, and 132 were on target for placement in 2014. Both mentors and participants have given the program glowing reviews. New graduate Bridgid McGowan, RN, says: "Te clinical coaches have made the transition from student to new grad RN, while not easy, defnitely less painful than I imagined. Te support I've felt from the program is what has gotten me through many a difcult shif, and I am eternally grateful to have been a part of this educa- tional new-grad program." Since this patient care area became a dedicated education unit, measurements document a signifcant increase in patient satisfaction, nursing core measures, and employee engagement. As Scripps strives to eliminate variation, it is increasingly important to provide a consistent, high- quality new grad experience. 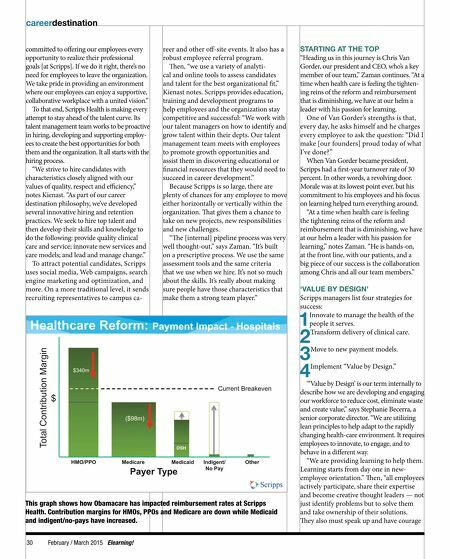 ONWARD AND UPWARD "We know there will be challenges ahead: an aging workforce, new generations with different preferences, a continued shift in health-care reform; forecasting and planning for service expansion, growth, turnover and retirement," Kienast notes. But if the past is prologue, Scripps Health will be on the cutting edge of innovation, employee growth and patient care. It will continue to be a "career destination employer." 'Te culture of Scripps is one that has been created to enhance our capacity to make sure we have the right people in the right place with the right skillsets.' —Veronica Zaman, Scripps Health, VP of Human Resources and Learning This illustrates Scripps Health's "pipeline" for a targeted role transition process for employees who are moving horizontally or vertically within the organization.